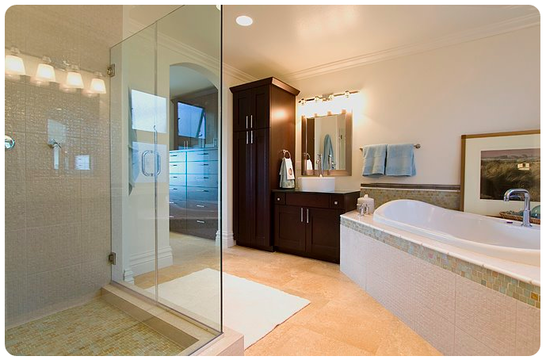 From shower remodeling to custom bathrooms, room additions and much more, we are here to help. Call locally or look below. BKR Pros is a leading residential, industrial and commercial remodeling company with affiliates in Long Beach, Santa Monica, Hollywood and the Los Angeles area. We have more than 30 years experience in all phases of remodeling and specialize in custom shower and bathroom renovations. No matter what your needs, we can help. With branches in every major area of the U.S., we are here to assist you and your family. A shower can be as small as 32x32 inches, but a 36x36 inch shower is considered the minimum for comfort and safety; anything smaller literally limits the elbow room and ability to step out of the stream of water if it suddenly changes temperature. To make shaving in the shower easier, include a fog-free mirror and a niche for shaving accessories. We are happy to install such custom items including glass shower doors and other amenities. For safety, all shelves should be recessed into alcoves. Eliminate as many protrusions as possible in and around showers and tubs so they won't be in the way in case of a fall. Shower Faucets: Shower faucets should be accessible from outside and inside the shower enclosure so the water flow and temperature can be adjusted from either place. The National Kitchen and Bath Association recommends that shower faucets be offset toward the shower door rather than centered below the shower-head. This makes it easier to control the water flow without getting wet. Standard shower faucets are available with separate hot and cold controls or with a single-handle control. Spending more for high-quality shower controls will probably pay off in longer, more trouble-free service. A high-quality shower faucet carries a warranty and is made from heavy brass parts that are easy to replace. Heavy brass is a common building material in east LA and Los Angeles in general. Like other bathroom fixtures, a wide variety of shower heads are now available in most hardware stores and home centers. Simple, water-saving models are available for less than $10 and elaborate models with massage settings can run well over $100 these days. Some of the high end shower-heads can be programmed for water temperature and flow rate. Hand-held shower heads allow more freedom for directing the spray and make a great upgrade during a remodeling project. Some models can be mounted on a vertical bar, allowing the entire spray mechanism to slide up and down. Because they are versatile and adjustable, hand-held shower-heads work well for children and disabled people. An alternative to the traditional shower head is the shower bar, which contains several nozzles arranged in a row. Buyers Guide: For a truly relaxing experience, add a steam generator, which can be purchased as a kit to be retrofitted in an existing shower, or you can buy one as part of a pre-fab set. Be sure your shower has a seat, a ceiling, and a door that seals shut to keep the steam in.